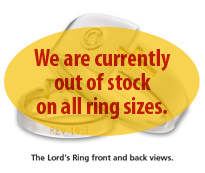 In our desire for The Lord’s Ring to be used for God’s glory and purpose, a portion of every sale will be donated to a Christian ministry or charity. Buyers have the opportunity to choose which charity receives a donation from their Lord’s Ring purchase. Click on the Choose Charity drop down menu and select the charity of your choice (or the charity that someone has asked you to choose when they referred you to The Lords Ring Web Site). Indicate the quantity of rings desired for that size. If you want to order more rings in other sizes, click Continue Shopping and follow procedures 1 through 4 for each size. Fast Shipping! In stock items will be shipped on the same business day if ordered before noon, PST. All orders should be received 3 to 5 days after being shipped. Overnight shipping is available through United Postal Service at $19.95. Download our ring sizing instructions and chart.